Beyond the wedding plans and family gatherings, there are several things that a couple would need to secure before they can legally declare themselves as a married couple. In most jurisdictions, an official statement is issued by the government after the couple signs a civil registration of their marriage. This comes in the form of a wedding certificate. This document serves as a contract template that proves the social union between two individuals and binds them legally, economically, and emotionally. 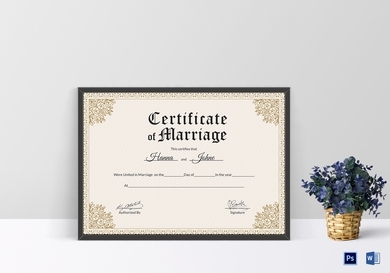 While some individuals choose to store their marriage certificates in folders and vaults for safekeeping, others like to show them with pride by framing the certificate to put on display. If you want to do the same, the certificate template provided will be a good alternative for you to use. It can even serve as a replica of your original wedding certificate that you can use as a home decoration for guests and visitors to see. You can easily customize the certificate to meet your own requirements so you can achieve a personalized wedding certificate with ease. 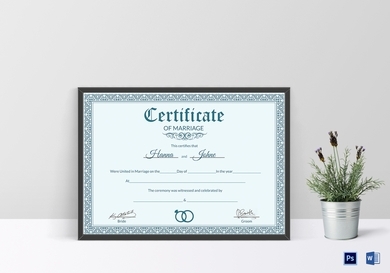 If you’re looking for a good gift idea to celebrate your wedding day or anniversary with your significant other, this beautiful antique marriage certificate is the perfect option. While it might seem quite cheesy to even consider, gifting your partner with a personalized wedding certificate is a romantic gesture that won’t possibly go unrecognized. It’s a creative way to express how much you care about a person without having to break the bank. Simply download the template, customize its content, have it printed, and you’re good to go! In Christian beliefs and practices, the union between a man and woman is ordained by and before God. The Sacrament of Matrimony is something that Christians strongly believe in. Although the concept of marriage has gradually evolved over the last century or so, conservative Christians tend to recognize marriage only if a religious ceremony had been officiated by a pastor. In addition to a marriage license, a Christian wedding certificate must also be signed within a number of days to validate the union. Common law marriage is still considered legal in numerous cities and states across the globe. If you’d rather skip the whole process of purchasing a marriage license and making it official with a formal ceremony, your marriage to your partner may still be legally recognized as long as a marriage certificate is in place. You can host a small get-together with your closest friends and family members and use the wedding certificate to prove that you are, indeed, husband and wife. You can keep it simple by using a classic wedding certificate that you can hang up on your living room walls for people to see. 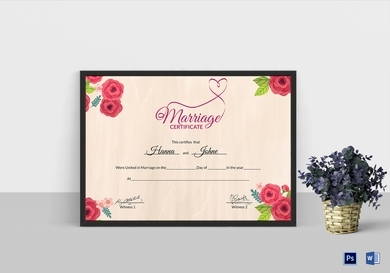 If you’re looking for something fun and creative to gift your spouse, a floral wedding certificate is a good option to go with. It’s an awesome way to honor your partner and celebrate the time you have shared together as a married couple. 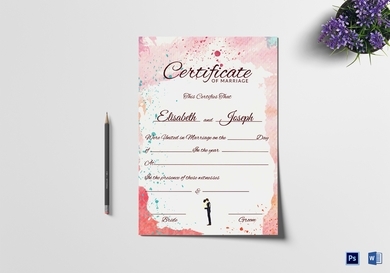 Contrary to the previous template provided, this floral wedding certificate uses a burst of color to design the layout of the certificate and make it appear a million times more appealing. That way, your spouse can proudly showcase your wedding certificate somewhere around the house. It’s always nice to keep things formal, especially when you want to honor something with a high sense of class. 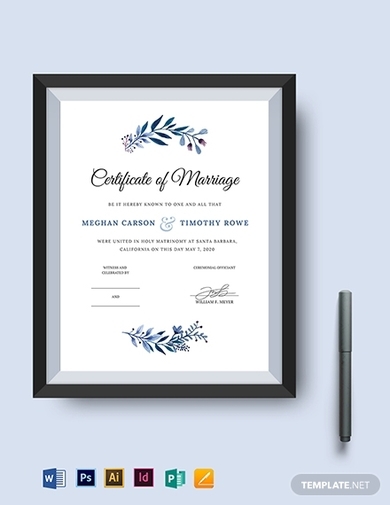 This formal wedding certificate may be used for various occasions, like an official certificate to acknowledge your union as a married couple or as a decoration to commemorate the said matter. This allows you to keep your wedding certificate as unique as possible, without sacrificing the legal standards of the document. There are many reasons why couples are required to get a marriage certificate to legalize their union. 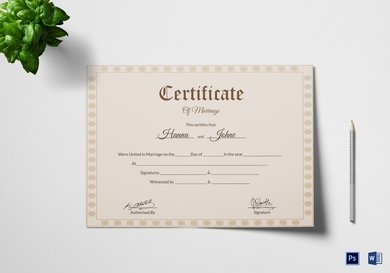 For one, a certificate is a wedding contract that proves that a couple had undergone the necessary steps to validate their marriage. This is important when applying for loans and mortgages and for processing official documents in government agencies and banking firms. One way to ensure you don’t end up losing or misplacing the certificate is to make sure it appears professional and legit. This will enable your mind to prioritize the document, be mindful about what it looks like, and remember where it is stored. When it comes to designing a wedding certificate, it’s always best to keep things simple. For a legal document such as this, you might want to steer clear of flowery words and other unnecessary elements. A simple wedding certificate is extremely easy to make with the help of this template. All you need to do is fill in the certificate with your personal information and edit the content to cater to your desired preferences. 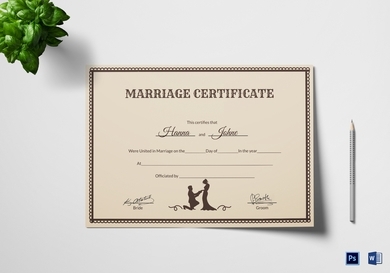 Looking for a simple yet attractive wedding certificate to signify your union as a couple? This vintage wedding certificate could be the right one for you! The stunning combination of texts and graphics generate a sophisticated look for your certificate to stand out. Even if you aren’t married and just need some sort of ornament to decorate your party, this vintage wedding certificate design will be the perfect addition to your landscape. 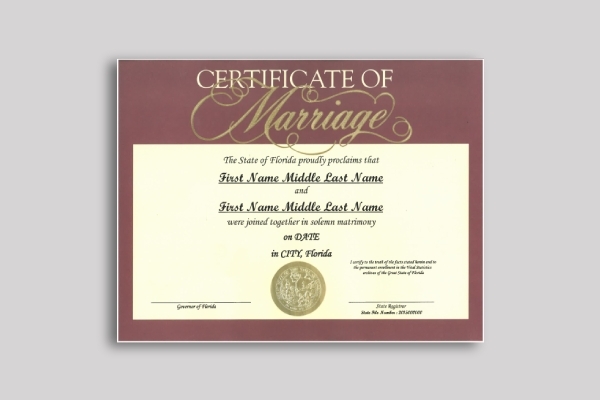 Shown above is an example of a wedding certificate issued by the State of Florida. 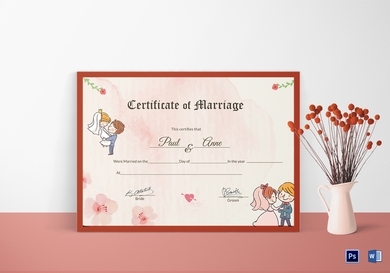 The certificate contains details of one’s marriage, including the names of the couple in question, the date of their marriage, and the place where the certificate was issued. The document must then be signed by those responsible for the registration in order for the certificate to be valid.